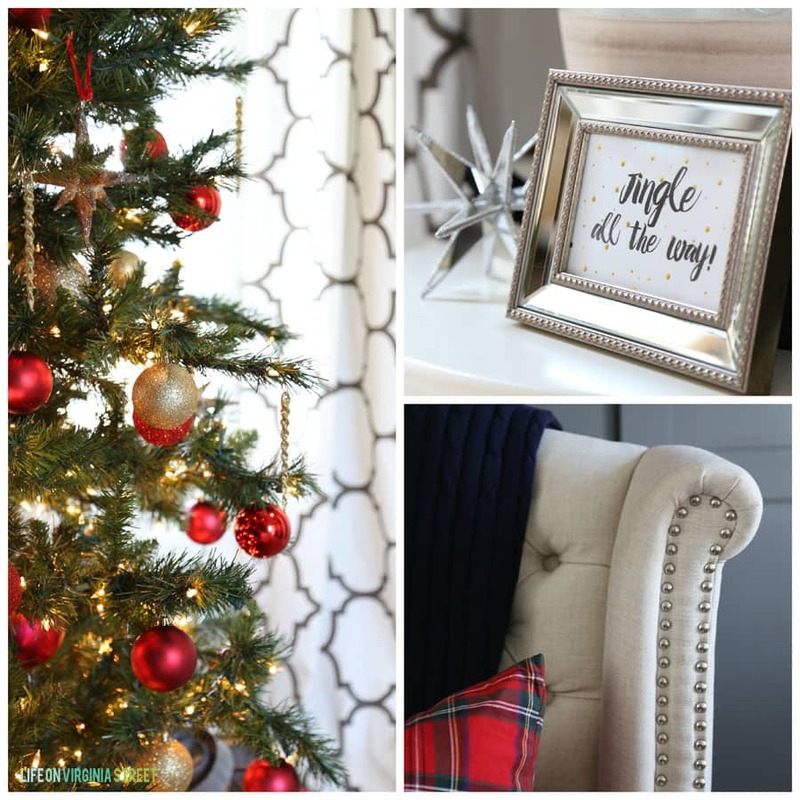 Today I’ve teamed up with my friend Jen from Migonis Home and Wayfair to share another part of my Christmas home tour with you! 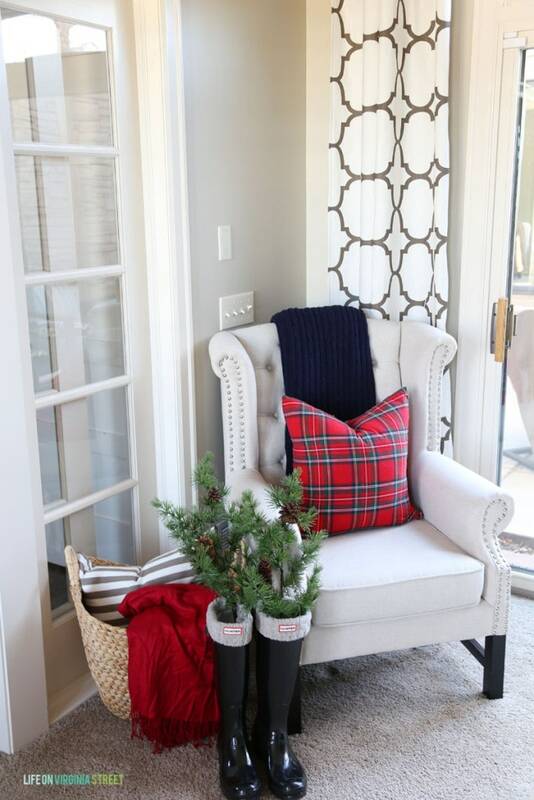 Today I’ll be sharing a few recaps from my tour last week, and sharing with you our front porch and office! Welcome to our home! 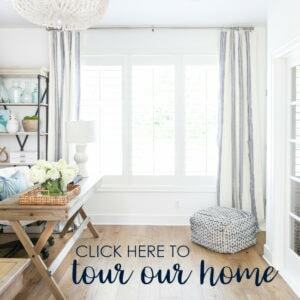 It’s hard to believe we had a few inches of snow on the ground for last week’s home tour! This past weekend it almost looked like fall again, if not for the Christmas decor. 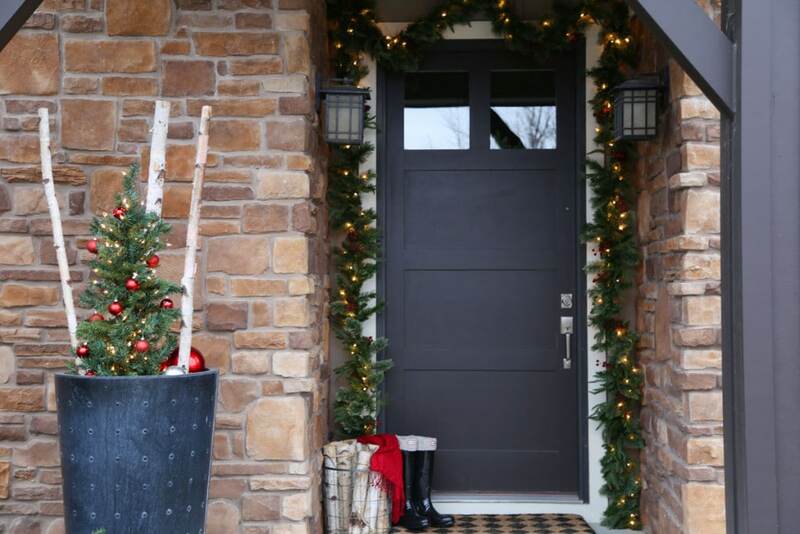 For the first time since we’ve lived here, I decided to add garland around our front door – and I absolutely love it! 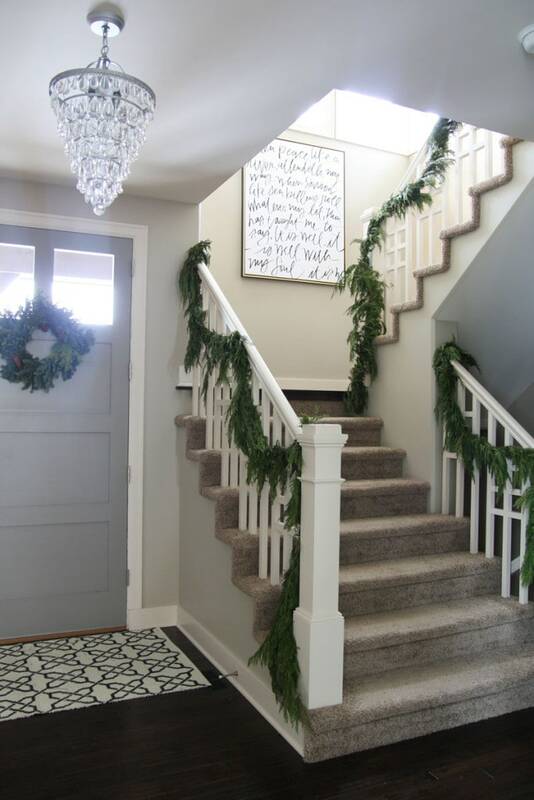 I attached three strands of this Colonial feel-real garland and I was good to go. It looks just as beautiful during the day as it does at night! Let’s step inside! 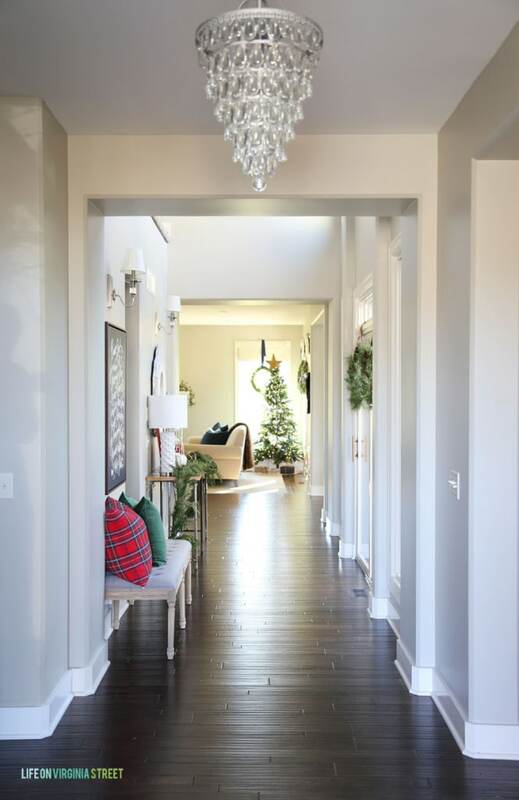 We’ll explore the hallway, upstairs and other rooms on the main floor tomorrow. Just around the corner from our front door is my office. The first picture is from last week’s tour, before I decorated the tree in my office. 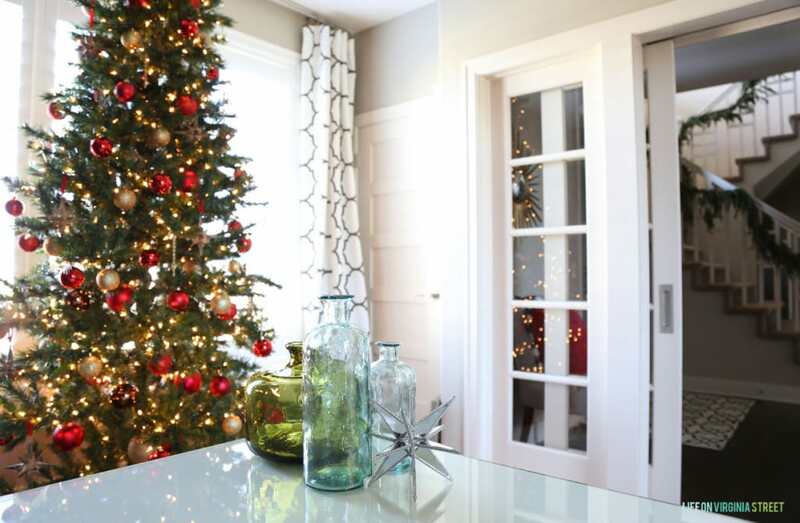 The second shows a peek around the corner with the fully decorated tree! I did something in my office this year that I’ve never done in the past – I went with traditional colors! Historically, I was limiting myself to my DIY artwork colors – blues, aquas, and greens. This year, I whipped up a new, plain/distressed red canvas so that I could play with some new, more traditional Christmas colors! Last week I also shared a few updates to my guest bedroom, so be sure to check out last week’s home tour post for more pictures and details! I actually was looking at this picture again and just now realized Hawkeye, my little black cat, is hiding out. Bonus points if you can see him! 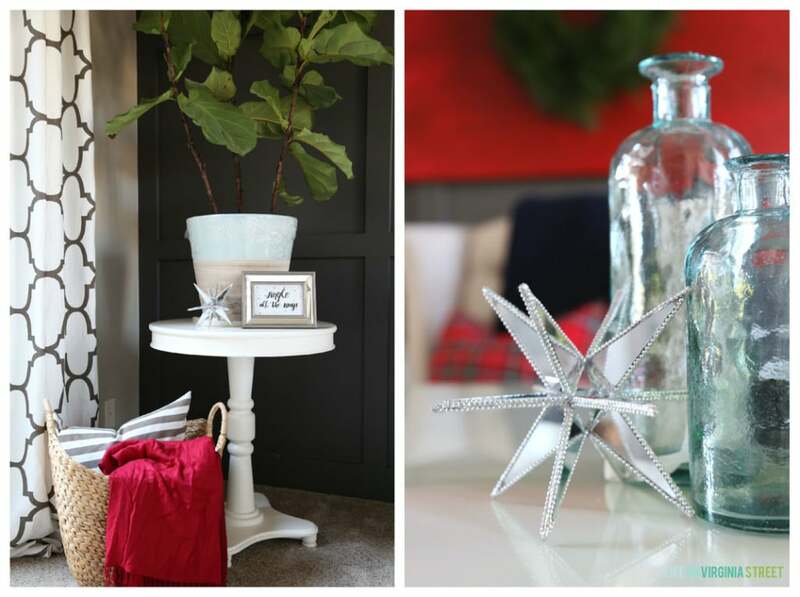 Stop by tomorrow, when I’ll be sharing most of the remainder of my Christmas Home Tour! 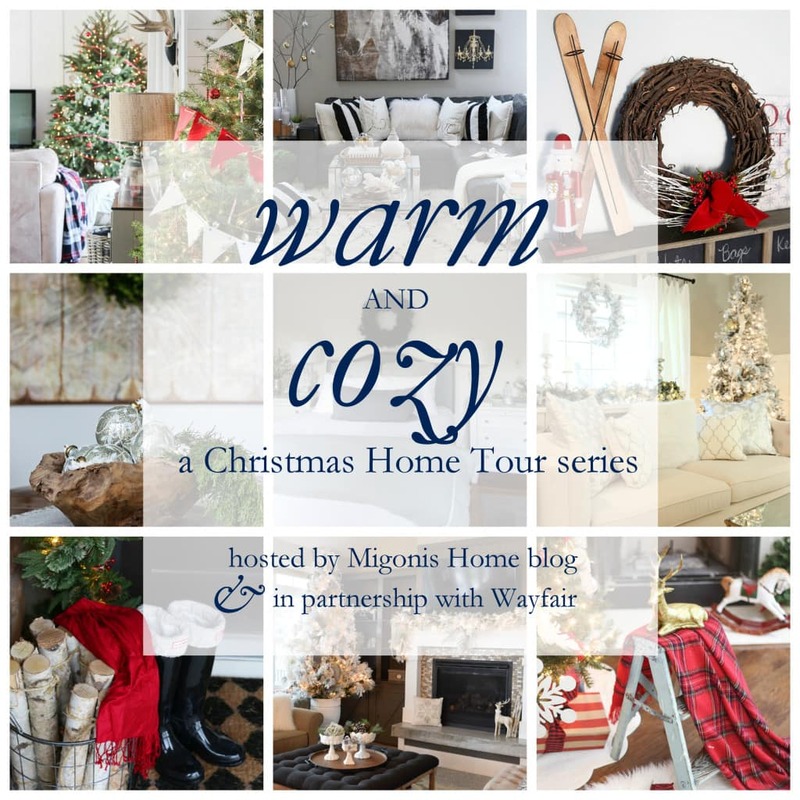 Now, be sure to stop by all the other gorgeous homes on the Warm & Cozy Christmas Home Tour hosted by Migonis Home blog. I have provided the links for all five tours below. Disclosure: This is not a sponsored post. However, Wayfair did provide me with a gift card to purchase a few items for this post. Affiliate links are used in this post. So so beautiful. 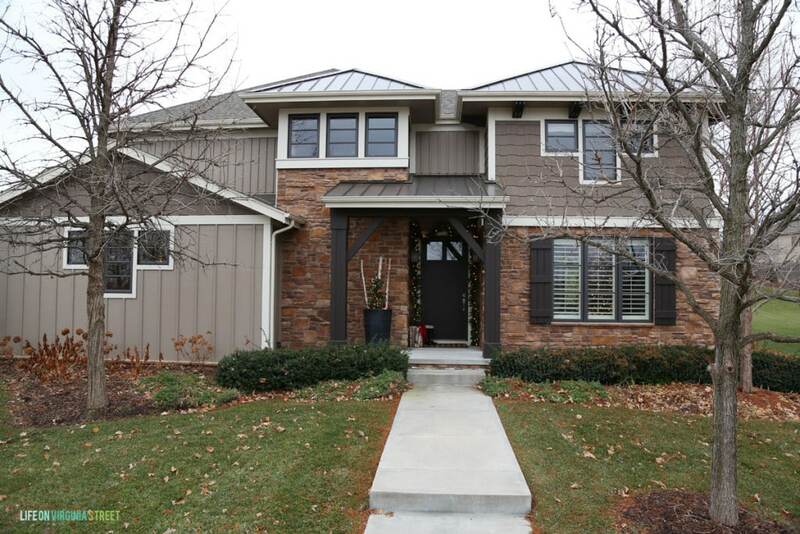 Your exterior is so stunning too and that guest bedroom is so divine. Loe the classic touches of red. Gorgeous! 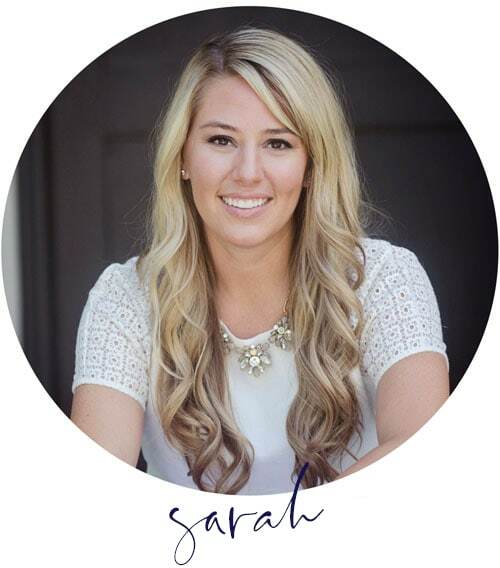 I’m really enjoying all of your holiday home tours, Sarah! 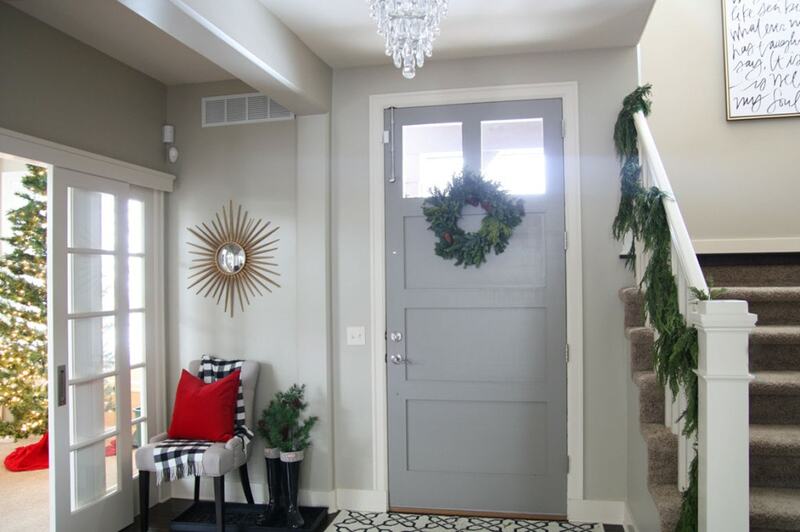 I love the addition of the red canvas and your entryway – gah, it’s STUNNING! Gorgeous Sarah!! I love the hits of red in your office!! I love what you did for your Christmas tour. 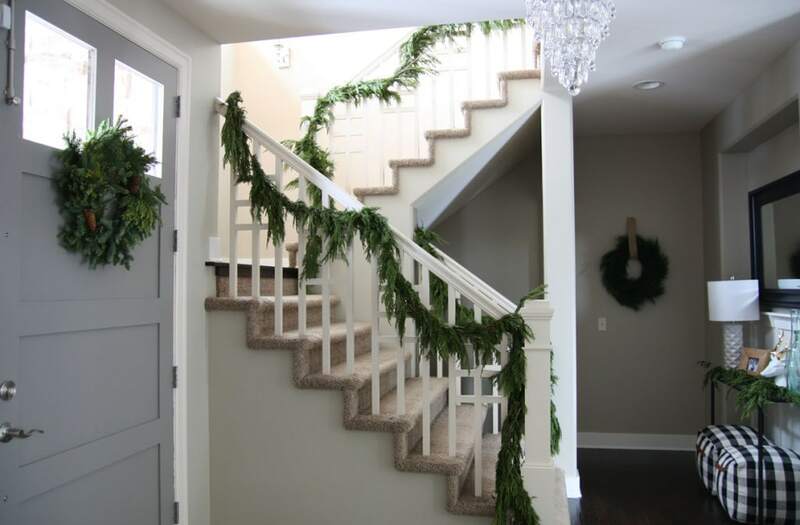 Your decorating is so elegant and classy. Thank you for sharing your home. Absolutely gorgeous! 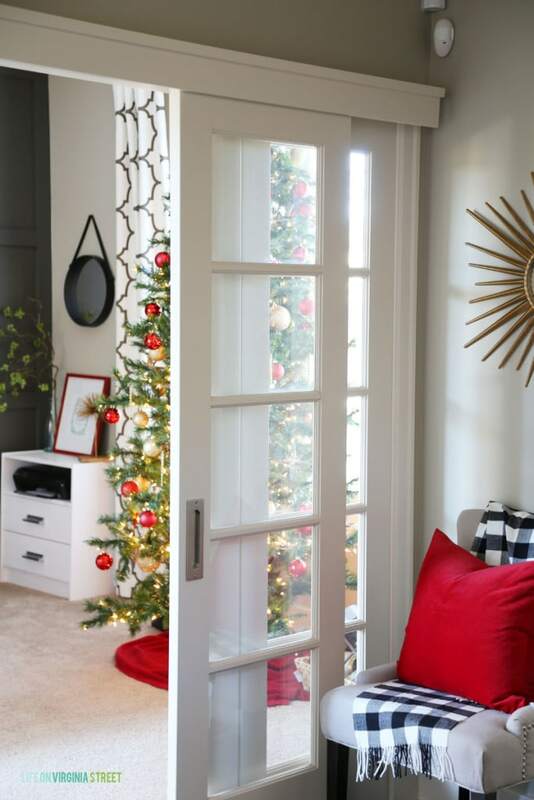 I love the simplicity of your design and the little details makes everything look extra special! Absolutely gorgeous! Gosh I love your house! 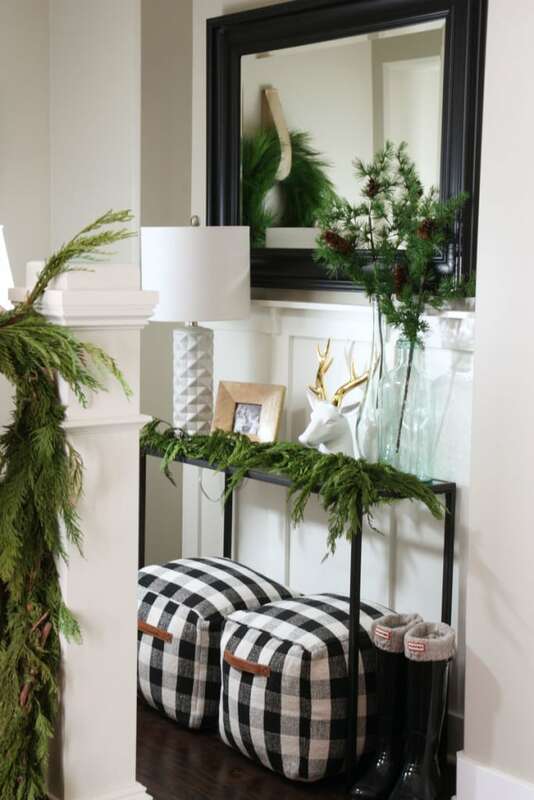 I just started following you and I simply love your clean, cozy style! I love your front porch with the boots and the red throw! And thanks for the Wayfair giveaway. 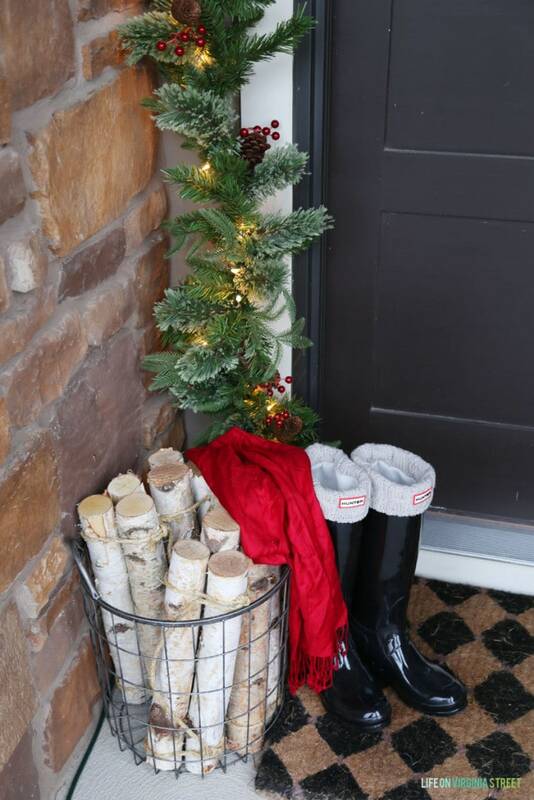 Love the boots and chopped wood as front door decor! 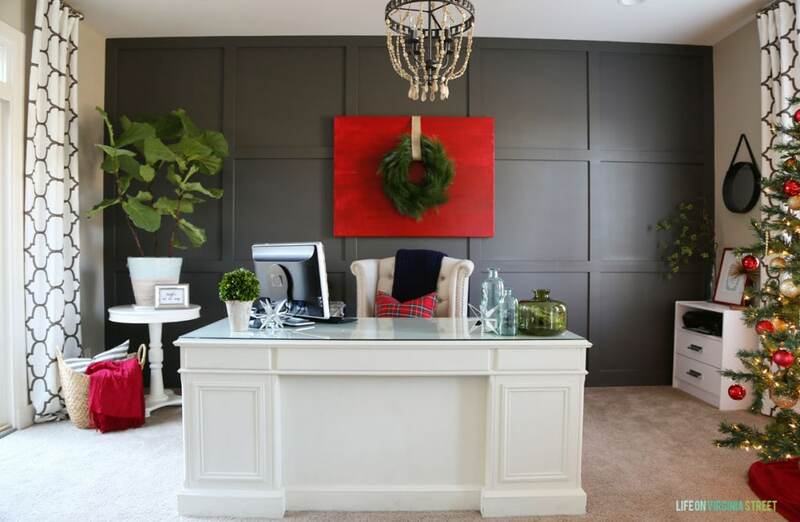 LOVE the hints of red among the gray wall in your office and the use of white and black as well! Looks very inviting! 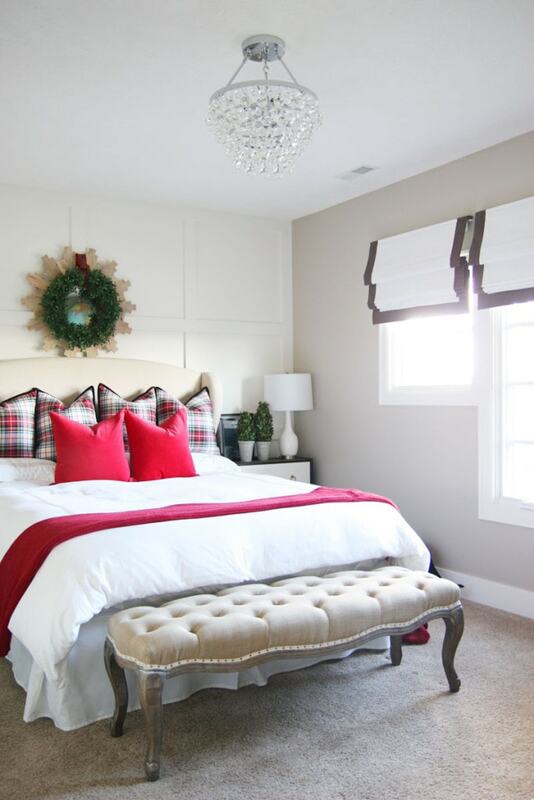 Love the pops of red! Merry Christmas! Thank you so much for offering such a wonderful giveaway! I would buy a new area rug for our living room. I would buy the 72″ Cat Tree by Go Pet Club in black. Love your house!! Thanks for the giveaway! If I won I would get a new co9ffe table.